But what a great name!! Note: This week’s WordPress Photo Challenge theme is Unlikely. We’re asked to capture the unexpected, the everyday in an unlikely place, the unpredictable. 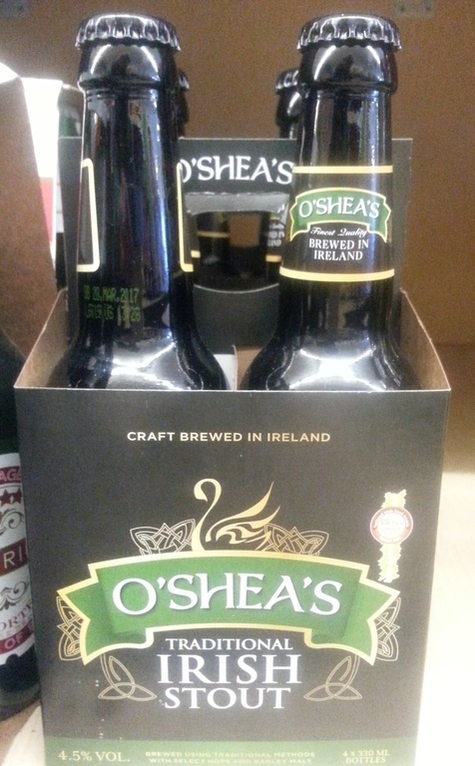 My pen name is O’Shea, and when I spied this Irish stout on the grocery shelves recently, I knew I needed its photo. Who knows, maybe one day I’ll get back to Ireland and look up the brewers! This entry was posted in Uncategorized and tagged beer, craft brewers, Haiku, unlikely, wp Photo Challenge. Bookmark the permalink. Thanks, John, both for reading and commenting. Sorry I’m late to respond, but we got caught in a mass of thunderstorms most of the last two days. Know how Illinois thunderstorms can be. I confess I didn’t buy this pack and now the store is closed for remodeling. Once it reopens, I’ll have to check and see whether they still carry O’Shea’s. Not that I’m a beer drinker these days, but Dave Barry’s quote holds some fond memories from when I was just out of college! HA! What a PERFECT name, Debbie! As you know from several of my posts, Philly has a TON of Irish Pubs; especially in the area I live. My brother and I went to several when he was here visiting over a year ago. I don’t drink beer, however, I love the food in Irish Pubs. I’ve been to one called, McGillin’s Olde Ale House, and had their burgers and fries. OMG…they were so delicious! Hope you’re having a fab week, my friend! We just got hit with a horrible heatwave which will continue through the next two days. Tomorrow the temperature will rise to 95 degrees. And it’s MAY!?!?! I do remember that, Ron! When Domer and I went on that ill-fated trip to Ireland, we stopped at an Irish pub where the food was delicious, too. I think fish and chips was on the menu then. Well, we have a little something in common here — sort of. My name is a shortening of Leinenkugel, the name of the Wisconsin brewery that produces one of my favorite summer drinks: the shandy. It’s a combination of beer with lemon or orange, and it’s delightful. It’s light, and really thirst-quenching, which is important down here in the summer! I’ve never heard of a shandy! I imagine something that refreshing would hit the spot on a hot day — citrus is good about that, with the added benefit that it’s GOOD for you! Isn’t it fun having a brewery named after you (sort of, anyway!)? I think I’d enjoy the one with lemonade in it. Did you see the similarity between your gravatar and their logo?? I hadn’t seen that, Debbie — perhaps because I know what the rest of the painting my gravatar’s drawn from looks like. But you’re right about the similarity. Good eye! What a well-named stout, I say! The Irish know a thing or two about their beer, certainly. That’s for sure, my friend!! Bless your heart, Mo! I’m looking forward to this store’s reopening so I can see if they’re still going to carry this brand.